Railroad-Professional - The popular track planning software. Freeware: TrackComputer. According to the trade press, Railroad-Professional is the clearest and easiest to use of all track-plan programs on the market, as users confirm in numerous letters. Combine different track systems and even design your own in no time at all. 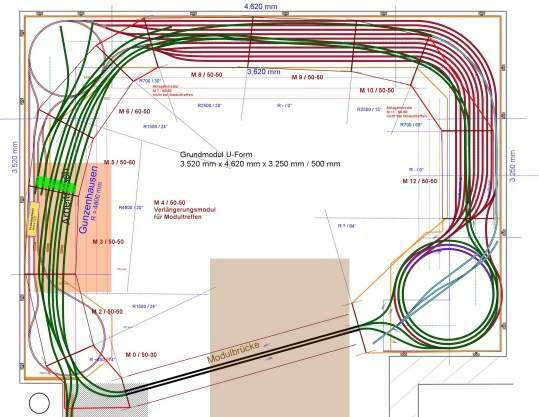 With Railroad-Professional - the software for creating track plans - your ideas will finally find the solution! how easy it can be to lay tracks..."
Clear, fast, direct. That's how track planning has to be. Sample track plan "Gunzenhausen", created with Railroad-Professional (11 layers displayed simultaneously). Provided by courtesy of Mr. Günter Bürkel. For a more detailed representation please click on the picture! Railroad-Professional is the software for your model railway and has been successfully on the market for over 20 years. Initially available as freeware, the track layout software Railroad-Professional quickly made a name for itself. Its intuitive, very easy operation, technically precise planning and the possibility to design your own track systems with the integrated library manager and track editor quickly made it one of the most popular track planning software for model railways. 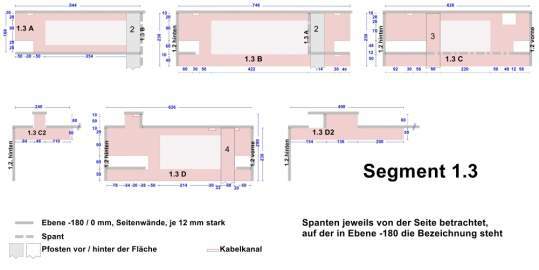 Example plan (signal box) of the railway station of Bellinzona/Switzerland, created with Railroad Professional. 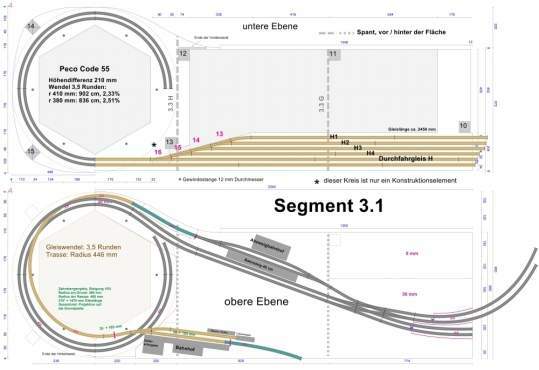 Provided by courtesy of Mr. Ernst Triet (→ www.bahnsimulation.ch). In the course of development, many features have been integrated in Railroad-Professional that were inspired by users of the previous versions. Thus, the current Railroad-Professional covers even better the needs of track planners who need no frills, but concrete support in their planning work and that despite technically precise accuracy combined with the proven, intuitive and child-friendly operation: components are simply pushed to the desired location by mouse, whereby tracks automatically snap into others if this is desired (i.e. when they are tackled at their end points). 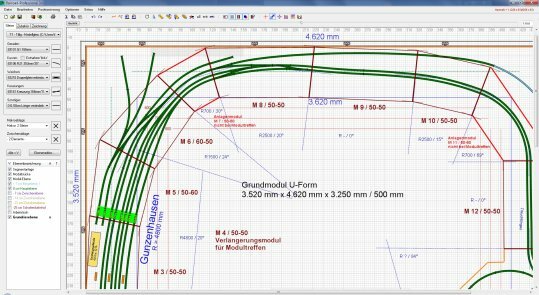 Railroad-Professional also allows technical design drawings. The following drafts are provided by courtesy of Mr. M.D. from E.
Of course, any flexibly switched track can also be converted back into a rigid track. Even more: even parts of a track (so-called segments) can be switched flexibly, while other parts of the same track remain rigid. A simple mouse click in the context menu of each track in the track plan is all that is required. This results in possibilities of correction, if it should "pinch" in the track plan once (which in reality you usually simply adjust to). Three-way turnout during deformation by flex system. Flex track before deformation by flex system. Flex track during deformation by flex system. The flex track automatically snaps into place at the open end and deforms to fit. The end result: a smoothly curved, clean track course! Both layers visible at the same time, each 50% transparent. The tracks of the lower layer shimmer through the ground plate of the above layer. Of course, the proven features are still available, such as the possibility to create any drawings and free text entries on the track plan, as well as outlines, dimensions, the drawing of constructive elements, decoration material and much more. And all work steps are carried out from the outset in high-resolution graphics. And best of all: Everything fits perfectly to scale, because Railroad-Professional has a calibration dialog for calibrating the program to your screen or printer. A 10 cm long track will actually have a length of 10 cm - just measure it! Of course you can scale everything additionally with a desired scale - stepless, of course! Those who like it less playful but rather technical, have the possibility to choose between different representations in Railroad-Professional. In the mode without sleepers and without graphic "accessories", the route is shown precisely. In this way, the roadways and possible bottlenecks immediately catch the eye. With just a few clicks, Railroad-Professional can be switched between a realistic display with all accessories (above) or the technical representation of the pure route (below). The program interface of Railroad-Professional while editing a track plan.